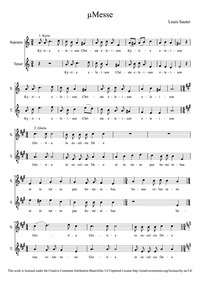 Description: Le Chat (Sauter, Louis); Louis Sauter was a American composer during the Modern period; Piecestyle: Modern; Instrumentation: Voice, Piano; Key: F major; Melodies|Songs|For voice, piano|For voices with keyboard|Scores featuring the voice|Scores featuring the piano|French language. 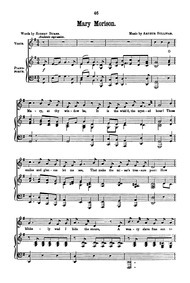 Description: ΜMesse (Sauter, Louis); Louis Sauter was a American composer during the Modern period; Piecestyle: Modern; Instrumentation: Soprano, tenor; Number of Movements: 5; Masses|Religious works|Duets|For 2 voices|For unaccompanied voices|Scores featuring the voice|Scores featuring the soprano voice|Scores featuring the tenor voice. 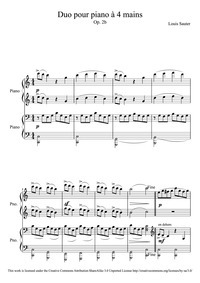 Description: Duo pour flûte et guitare, Op.2 (Sauter, Louis); Louis Sauter was a American composer during the Modern period; Piecestyle: Classical; Instrumentation: Flute, guitar; Opus/Catalogue Number: Opus 2; Key: C major; Pieces|For flute, guitar|Scores featuring the flute|Scores featuring the guitar|For 2 players. Description: Pièce pour guitare, Op.1 (Sauter, Louis); Louis Sauter was a American composer during the Modern period; Piecestyle: Classical; Opus/Catalogue Number: Opus 1; Key: A minor; Pieces|For guitar|Scores featuring the guitar|For 1 player. 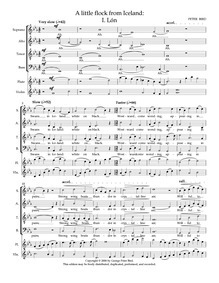 Description: Air (Sauter, Louis); Louis Sauter was a American composer during the Modern period; Piecestyle: Classical; Instrumentation: Guitar; Key: A minor; Pieces|For guitar|Scores featuring the guitar|For 1 player. 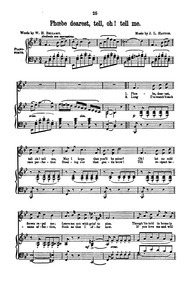 Description: Good-bye, Sweetheart, Good-bye (Hatton, John Liptrot); John Liptrot Hatton was a English composer during the Romantic period; Piecestyle: Romantic; Instrumentation: voice with piano; Key: C major; Songs|For voice, piano|For voices with keyboard|Scores featuring the voice|Scores featuring the piano|English language. 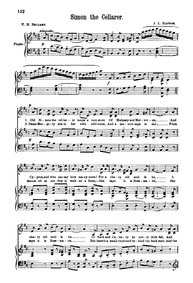 Description: Simon the Cellarer (Hatton, John Liptrot); John Liptrot Hatton was a English composer during the Romantic period; Piecestyle: Romantic; Instrumentation: voice with piano; Key: D major; Number of Movements: 1; Songs|For voice, piano|For voices with keyboard|Scores featuring the voice|Scores featuring the piano|English language. 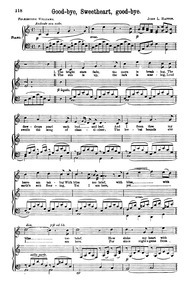 Description: To Anthea (Hatton, John Liptrot); John Liptrot Hatton was a English composer during the Romantic period; Piecestyle: Romantic; Instrumentation: voice with piano; Key: E major; Songs|For voice, piano|For voices with keyboard|Scores featuring the voice|Scores featuring the piano|English language. Description: Phoebe Dearest, Tell, Oh! 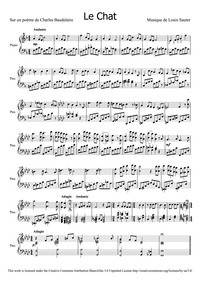 Tell Me (Hatton, John Liptrot); John Liptrot Hatton was a English composer during the Romantic period; Piecestyle: Romantic; Instrumentation: voice with piano; Key: B♭ major; Songs|For voice, piano|For voices with keyboard|Scores featuring the voice|Scores featuring the piano|English language. 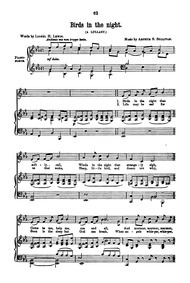 Description: Mary Morison (Sullivan, Arthur); Arthur Sullivan was a English composer during the Romantic period; Piecestyle: Romantic; Instrumentation: voice with piano; Key: G major; Songs|For voice, piano|For voices with keyboard|Scores featuring the voice|Scores featuring the piano|English language. 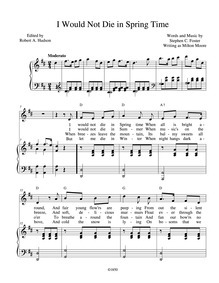 Description: Birds in the Night (Sullivan, Arthur); Arthur Sullivan was a English composer during the Romantic period; Piecestyle: Romantic; Instrumentation: voice with piano; Key: E-flat; major; Lullabies|For voice, piano|For voices with keyboard|Scores featuring the voice|Scores featuring the piano|English language. 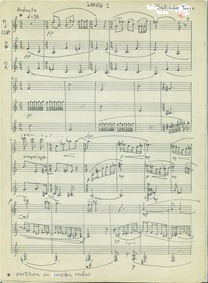 Description: A Little Flock from Iceland (Bird, Peter); Peter Bird was a American composer during the Modern period; Piecestyle: Romantic; Instrumentation: SATB chorus, flute, violin; Opus/Catalogue Number: PB 8; Number of Movements: 4; Secular choruses|Choruses|For mixed chorus, flute, violin|Scores featuring mixed chorus|Scores featuring the flute|Scores featuring the violin|For chorus with solo instruments|English language. 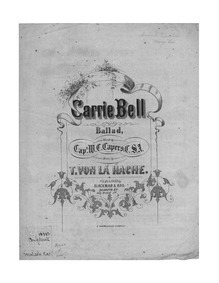 Description: Carrie Bell (La Hache, Theodor von); Theodor von La Hache was a German composer during the Romantic period; Piecestyle: Romantic; Instrumentation: Voice, piano; Key: A major; Number of Movements: 1 (4 strophes); Ballads|For voice, piano|For voices with keyboard|Scores featuring the voice|Scores featuring the piano|English language. 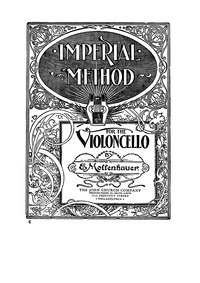 Description: Imperial Method for the Cello (Mollenhauer, Eduard); Eduard Mollenhauer was a German composer during the Romantic period; Piecestyle: Romantic; Instrumentation: Cello; Methods|Studies|For cello|Scores featuring the cello|For 1 player. Born in Erfurt, died in Minnesota. A violin pupil of Ernst and Spohr. Settled in New York in 1853 according to Baker/Remy. 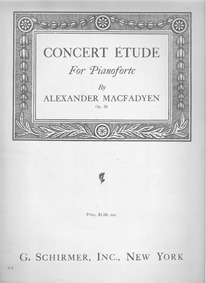 Description: Concert Etude, Op.26 (MacFadyen, Alexander); Alexander MacFadyen was a American composer during the Early 20th century period; Piecestyle: Romantic; Instrumentation: piano; Opus/Catalogue Number: Opus 26; Studies|For piano|Scores featuring the piano|For 1 player. 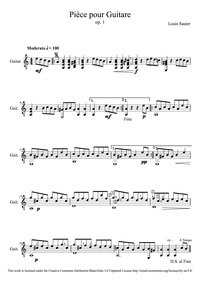 Description: Jardin I (Torre, Salvador); Salvador Torre was a composer during the Modern period; Piecestyle: Modern; Instrumentation: Flute and two clarinets. 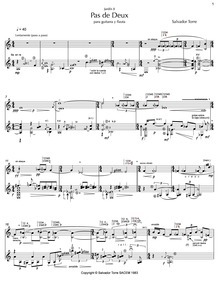 or three clarinets; Number of Movements: one mouvement; Pieces|For flute, 2 clarinets|Scores featuring the flute|Scores featuring the clarinet|For 3 players|For 3 clarinets|Scores featuring the clarinet|For 3 players. 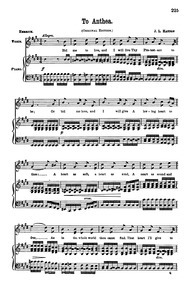 Description: I Would Not Die in Spring Time (Foster, Stephen); Stephen Foster was a American composer during the Romantic period; Piecestyle: Romantic; Instrumentation: Soloist and Piano; Key: D major; Number of Movements: 1; Songs|For voice, piano|For voices with keyboard|Scores featuring the voice|Scores featuring the piano|English language. 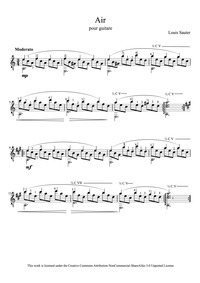 Description: Jardin II (Torre, Salvador); Salvador Torre was a composer during the Modern period; Piecestyle: Modern; Instrumentation: Flute and guitar; Number of Movements: one; Pieces|For flute, guitar|Scores featuring the flute|Scores featuring the guitar|For 2 players. 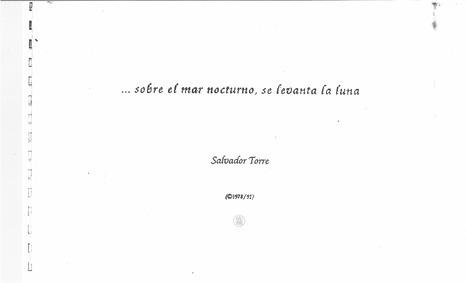 Description: Sobre el mar nocturno se levanta la luna (Torre, Salvador); Salvador Torre was a composer during the Modern period; Piecestyle: Modern; Instrumentation: unspecified; Number of Movements: 1; Pieces|For 1 instrument|Scores with open instrumentation|For 1 player.